Zimbra desktop is cross platform, free, open source email client application and it works with many popular email systems. 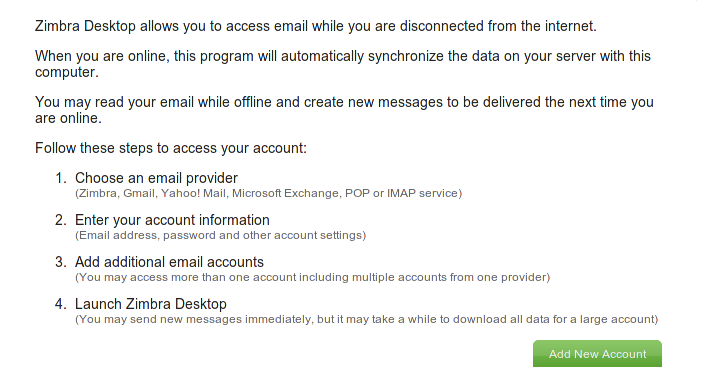 This application supports Zimbra, Gmail, Yahoo and Microsoft Exchange account types. Zimbra desktop lets you synchronize emails, calendar and contacts data between mailboxes in both local and cloud storages. You can also setup multiple accounts in your zimbra desktop application. The latest Zimbra desktop version is 7.2.5. We will be reviewing its installation process on Ubuntu 15.04 today. Launch your terminal and run following command to download the latest Zimbra desktop version for Linux. Wait for the download to finish, as soon it is completed, extract the downloaded file by running the following command on the terminal window. Ready to start installation? Simply run following command to initiate the installation process for Zimbra Desktop. On next step, accept the Install agreement by typing “A” and hit Enter to proceed. On third step, specify Zimbra install path, Leave blank if you want to continue with defaut settings. Hit Enter to proceed to next step of installation. During installation process, it might ask you for to confirm if you want to install user data files, the default answer here is No, but you can choose Yes too and it will install user files for the user you have initiated install process with. Congratulation, Zimbra Desktop install is complete now . "/opt/zimbra/zdesktop/linux/prism/zdclient" -webapp "/home/linuxpitstop/zdesktop/zdesktop.webapp" -override "/home/linuxpitstop/zdesktop/zdesktop.webapp/override.ini" -profile "/home/linuxpitstop/zdesktop/profile"
Once Zimbra Desktop has been launched, go ahead with your email configurations in the application. WARNING: ia32-libs is missing for x86_64 platform. This package is required to run Zimbra Desktop on 64-bit Linux. Java SE Runtime Environment (JRE) not found. Please install JRE 1.6 or later. please allow us sometime so we may properly test it on Ubuntu 16.04 and will update this article. Thanks! nothing new for ubuntu 16.04 ?